I found these today (pic1, pic2, and also a movie of the grossness). At first I thought they were enormous chunks of animal fur, as if a skunk had gotten into a tussle with my cats. As I got closer I realized they were too big for that and thought, "Bizarre, some metal filings have somehow magnetized and oriented/fluffed into long strands." Then I noticed that they are sprouting from the floor. OMG. The "base," for lack of a better word, seems elongated and has short, white/grey fluffiness. The long hairs are very glossy and seem tacky when I prod them. Sure enough, there seem to be bits of oily residue on the thing I used to touch it. You can see tiny droplets on some of the other photos. Maybe a mold or fungus? Maybe some cat poop that is...growing? (My cats get trapped down there every once in a while and there are telltale cat scratches around it.) Maybe something from the recent rains (New England)? Maybe oil mixed with some...entity? I vote for mold and mold spores. either that or somebody spilled some cartoon-grade hair growing formula down there. It probably smells, hence the cat scratches. That's a type of mold. 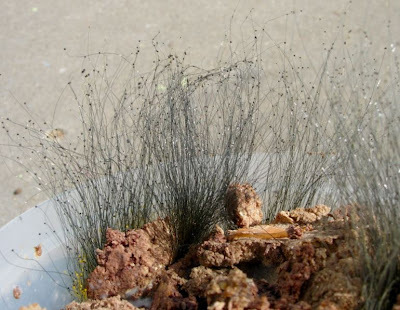 Phycomyces nitens? It grows on cat poop. Ew, ew, ew, I think this thread identifies it. I'm going to go shower now. For about a day. Nthing mold, but asking if we couldhave a NSFND (not suitable for near dinner) tag? Nthing yuck! too. Yep, poop fungus. Probably not zombies. I'm not sure what bothers me more, that it's poop fungus or that it's glossy poop fungus. Nature is so amazing and wonderful! Seriously, this thread (and the threads linked herein) have solved a mystery that I have wondered about as a oft-times-negligent-cat-box-cleaner (with white thready, furry mold - not your variety). So thanks! That is so incredibly, fundamentally disturbing. KILL IT WITH FIRE bleach. But in all seriousness, having dealt with a major (although, frankly, less disgusting) basement-mold issue, there's no "cure" for mold; the spores are everywhere, all the time. All you can do is prevent them from finding the conditions they need to grow. In this case, keeping the cat out of the basement would be a start. Or if that's not an option, put an actual litter box down there for him/her to use, and then empty it periodically. Thanks everyone, especially naju for the precise name. When Mr. Cocoa heard the word phycomyces, he remembered a story about Max Delbrück, "an amazing physicist who abandoned physics and wasted 25 years studying phycomyces!" Having seen what I saw in the basement, I do not consider those 25 years wasted. This is the scariest, and somehow also the coolest, thing I've seen in a while. Yeah, that mold is really cool!